Does Technological Improvement Hurt Productivity? The Minnesota Fed President Neel Kashkari is active on Twitter where he often conducts Q&As where any user can ask him questions. While we aren’t proponents of the Federal Reserve, the fact that he is willing to answer real critics and not just the media, which oftentimes asks what seems like staged easy questions, shows he cares about transparency and is open to debate. It’s also a breath of fresh air speaking with someone without a teleprompter nor a prepared speech. This creates for a very lively discussion where the best argument wins, regardless of where it originates. Sadly, Neel often wins the debates simply because there are many conspiracy theories and those who are blinded by rage that common sense and logic does not make it into the discussion. As a result, no discussion will advance into policy or any meaningful reform or movement if there is hatred spewing from both sides of the debate. Neel Kashkari is an intelligent guy who can easily win debates if you aren’t careful in your arguments and facts. With that introduction in mind, we tried to ask him a few questions using the #AskNeel hashtag. Because of the influx of questions, he was only able to answer one of our questions which you can see below. We asked if the Fed wanted to reverse the Amazon effect of deflation. With Amazon pushing prices lower for consumer goods, operating at slim margins, the consumer is getting a break. If the Fed wants to push inflation higher, it will be taking away the gains the consumer gets in spending power. We aren’t the only organization to mention this point. Goldman Sachs said in a report that Amazon is partially responsible for the low inflation. Goldman’s chief economist, Jan Hatzius, said Amazon is causing brick and mortar retailers to “cut prices in a desperate bid to stay alive” as they try to remain relevant with the advent of online competitors. The reality is these firms should be trying to add value, enticing customers to visit the stores in person. However, they have responded to the competition at the last minute, so price cuts are the only option in the short-term. Failing brick and mortar firms’ management don’t have great business sense. 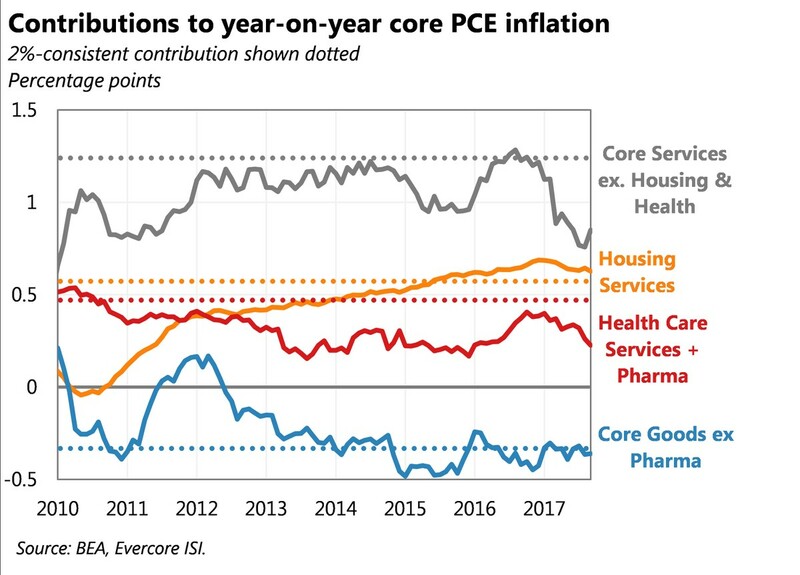 The estimate Jan Hatzius gave for the Amazon effect was a 0.25% reduction in core goods inflation and a 0.1% reduction in the overall PCE inflation. Neel starts his response by saying the Fed wants to hit its 2% inflation target. Essentially, this means the Fed is willing to reverse all the gains Amazon is giving to the consumer because it wants ‘price stability.’ That’s ironic because the value of the dollar has been anything but stable, as we pointed out previously. The literal definition of stability would be a 0% change, but that’s not what the Fed thinks because it is deathly afraid of deflation. Neel says he disagrees with Goldman Sachs that Amazon is causing deflation because he thinks productivity growth would be higher. That’s an interesting perspective because when you say productivity growth is the ultimate determination of technological advancements, you are effectively minimizing the effect the mobile internet has had on the economy. It’s not a stretch to say the mobile internet expansion has been a big factor on every aspect of the economy regardless of whether productivity growth has been high or not. Even the OECD says the global productivity slowdown “has occurred at a time of rapid technological change, increasing participation of firms and countries in global value chains (GVCs), and rising education levels in the labor force, all of which are generally associated with higher productivity growth.” Therefore, the point that Amazon doesn’t cause deflation because productivity growth is low, is moot. Technology advancement has been expansive in the past few years. Amazon’s willingness to have low margins has put price pressure on every good it sells. Online shopping overall is deflationary because price comparison shopping is so easy. There’s also no cost to the consumer in terms of gasoline and time traveling to the store as shipping is free with Prime subscription. Is Technology Improvement Accurately Measured By Productivity? Because of the size of the advancements in technology, some are questioning the efficacy of the productivity metric. Think about all the paper forms which have been eliminated by digital forms. Some take the other side of the argument saying that productivity growth is low because of the advancement of technology. People are spending a lot of time on their mobile phones and social media which cuts into their ability to work productively. Another theory is that the economy has put most of its resources into sectors which don’t have much productivity because the jobs in the productive fields have disappeared due to advancements in automation. These are all possibilities, but few would claim that because productivity growth is low, there hasn’t been much technological advancement. It’s also not a direct answer to call online shopping ‘tech.’ The ability to buy goods online has gotten better; that’s objectively true because the spending online has increased as a percentage of total retail spending. Even if tech as a whole didn’t improve, the online shopping experience certainly has. We think the reason why he didn’t get into the detail of the question by calling out a specific industry is because he wanted to make a general response without ruffling any feathers. To be clear, we don’t endorse the specific numbers Goldman came up with, but we do believe in the concept that huge retailers focused on low prices can have a negative effect on inflation. It might not be the main factor causing low inflation, but it is one of the factors affecting it. You can decide for yourself how much online shopping affects consumer prices. The key point is that if prices are falling because of advancements in online shopping, shouldn’t the Fed lower its inflation target? Isn’t the natural rate of inflation lower than 2% with prices falling for most goods? 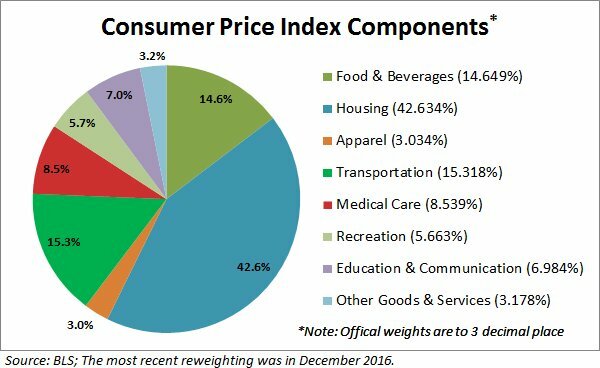 With the Fed looking to get to 2% inflation, it needs to cause the prices of other goods to increase or just devalue the dollar. We don’t think that’s a great idea. The two charts below show the components of the CPI and PCE reports, so you can see how the Fed looks at inflation. As we have noted previously, if the goal of the manager (Federal Reserve) of your currency (USD) is to devalue it systemically by way of 2% average yearly inflation, then that is anything but price stable. Perhaps you should become your own central bank and diversify your holdings of currency and money. Currency and money are not the same and it may be beneficial to know the difference: What is Money? NextWhat Sowed The Seeds Of The Bitcoin Mania?